I have a Celestron 11" Edge HD. The mirror shift is horrible even for small changes. Because of this I installed a moonlite focuser. Nonetheless, it bothers me and wondering is there a method to fix this for a DIY? Normally, the fix is just what you've done - use an external focuser like the Moonlight. Do you mean you'd like to fix it so you don't have to use a Moonlight focuser? If so, I don't believe there's any way. It's a fundamental design issue with SCTs. The mirror is attached to a tube which slides on the outside of the baffle tube. There has to be some clearance between the two so they don't bind up. That clearance allows the mirror to tilt a tiny bit when you change focusing directions, and that shows up in the eyepiece. You can drill and tap two holes in the slider tube inline with the focus shaft. One at the back of the slider and one at the front. Then use nylon set screws to take out the play in the slider tube. I have done this on my 14 and an eight inch unit. It works just fine. You can also do this with small roller bearings if you prefer. If you have installed a focuser, wouldn't the mirror locks prevent any shift? Put an eyepecie into the diagonal. Put the focuser in the center of its range of travel with your diagonal and eyepiece in place. Now, focus on a star using the telecope focuser knob. Once you have the telescope focuser knob at best focus, tighten the clutch lock knobs and then, put a little counterclockwise peressure on the focuser knob to pull the mirror back on the focuser side. Now, you should be able to focus using only the external focser. There should never be a need to loosen the EdgeHD miror locks or touch the EdgeHD focuser if you do this. I think that the play of the mirror is aggrevated by the drag of the rods coming out of the rear of the telescope (part of the lock mechanism). They used a very thich grease on these, and I beleive that the stiction of the grease prevents the rods from sliding easily in the shafts. While not a fix for mirror flop, a partion solution might be found by taking the lock mechanisms off (full clockwise on the focuser, remove the lock knobs, and remove the three screws that hold the lock assembly in place). Whiping the rod and flusing out the grease inside the hole should greatly reduce the stiction so that gravity along will settle the mirror rather than having to wait for it to settle against viscosity of the grease on the rods. I cleaned my rods and feel that it made and improvement, but the "Normal" flop is still there. Just not nearly as bad as it was before I cleaned the rods off. But you should be able to just lock the mirror down and not have any further problems. I think he means that the fact that there's shift in the scope bothers him, not the shift itself. Kind'a like that worrying noise in the car that never means anything. My question is when the last time the scope was broken down for a Clean, Lube and Adjustment? Depending use, climate and other variables this may have to be done every year. Dow high vaccuum grease, a thick silicone is often used to slow grease migration and and the resulting play in the mirror's sliding bits. It will also make focusing a bit stiffer. You can drill and tap two holes in the slider tube inline with the focus shaft. One at the back of the slider and one at the front. Then use nylon set screws to take out the play in the slider tube. How durable is this solution? The nylon screws will eventually wear out and/or the screws will simply loosen over time. Is the focuser still working smoothly? Make sure the mirror locks are disengaged. This usually causes 10x more shift than otherwise. Very smooth. I did this about 8 years ago on my Meade 14 and it is still smooth and no mirror shift. The weight is not on the nylon screws and the only time they see any pressure is during focus. The pressure they do see is at a minimum if they are inline with the focus rod. Once they were adjusted, I used a little finger nail polish to lock them in place and they are still fine. It works! The weight is not on the nylon screws and the only time they see any pressure is during focus. Is the OTA on a fork mount? Yes it is but the 8 inch I did is on an EQ mount and it is also still working fine. That's major surgery for the average Joe on an Edge SCT. But I like it, I like it! My old Meade 12" LX200 "Classic" has a spring-loaded primary mirror that has almost zero image shift when focusing. I'm not sure if any other Meade SCT model used this system or if any Celestron SCT ever had it. BTW, the old 8" and 10" Meade SCT's were shipped with a bolt through the back that screwed into the primary mirror to stabilize it. The bolt needed to be removed for the scope to focus properly ... but, it left a convenient hole to install a DIY SCT spring-loaded mirror stabilizer to get rid of focusing image shift. It worked great! Unfortunately, this information doesn't help the OP. However, I've always wondered why the spring-loaded design wasn't incorporated into other Schmidt-Cassegrain scopes to tame the dreaded image shift problem! They all need to be like the new 650 scopes. They use 6 rollers on the slider to make an internal crayford type focuser. No image shift at all. This can also be used to align the primary on axis. Thanks all. As Geo said well, I felt this focus shift was like a noise in my car. I felt that a scope costing so much should focus better. I will disassemble it and attempt some of the remedies provided here. BTW what is a "650" scope? Do you mean the LX850 or the LX600? The LX650 does not exist. However, both the LX850 and LX600 have the same OTA, the f/8 ACF, which indeed does have an excellent focusing system. One thing is for certain I have not found a need to purchase an aftermarket focuser for it. Going back and looking, it was the LX600 SCT that first used their internal crayford style focuser. There was a LXD650 mount. I think that this is a very good idea so last Fall I when overhauled my C14, I started out with the idea of making this mod, but once I saw what was involved, I chickened out. Now that you mention it again, I'm interested in giving it another go. Maybe you can answer a few questions to help me get past some of the problems I ran into. 1) I have some very short 6-32 Nylon tipped screws that I think should work well. What size screws did you use? 2) I was concerned about drilling and tapping right over the mirror surface. I can imagine using a piece of plastic (or maybe cardboard) to protect the mirror. How did you protect the mirror while you worked on the upper baffle tube? 3) The show stopper for me was the rear. I didn't have a good way to support the mirror up-side-down to work on the rear of the slider tube. How did you support the mirror and was there enough room to get a drill in there? Also, is the rear of the baffle tube slider a smooth surface, or do you have to drill through a threaded surface? I've attached some photos with this question pointing to the surface I'm talking about. Unfortunately, I didn't take a very good photo of this surface or I could see it. The attached collage shows what the tubes and support assembly looks like for a classic C14. I installed flop stoppers when I had the scope apart. This mod is a slightly less elegant version of the stabilization system installed on the factory HD systems. (I believe that Celestron might have actually copied and improved this design.) They work quite well to lock the mirror tilt but they wound up making the focus shift a bit worse. I think that your Nylon tip screw approach should work quite well to fix the problem and make the overall system much more stable. The one thing that I'd suggest is using purple Locktite rather than nail polish to secure the screws. Nail polish can work but Locktite will be more stable since it is actually made for this purpose and will wick in to fill the whole thread gap. PS I supposed that I could make a stable horizontal jig using a large wooden dowel (like a coat rack bar) to hang the mirror horizontally while I drill. How's that sound? Would this "mod" also work for a C14? It already has two threaded holes (and screws) used for locking the mirror during transportation? 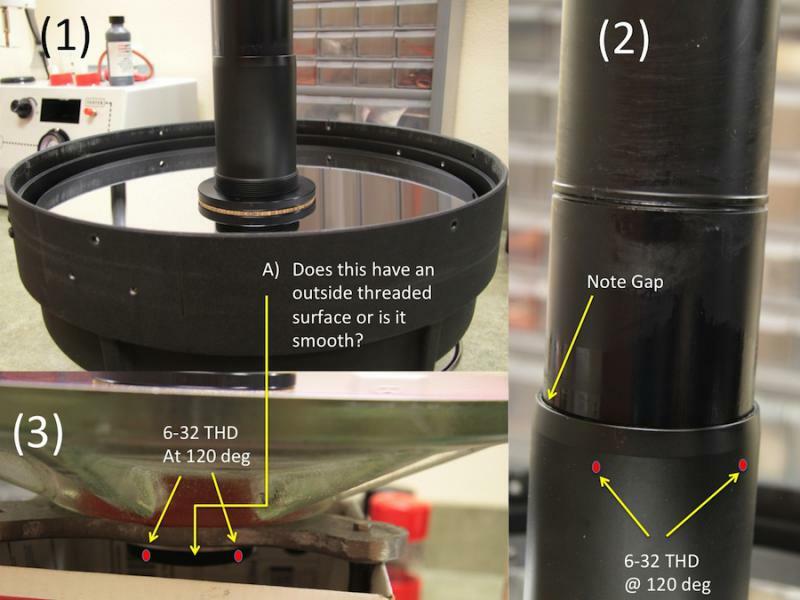 If the shift is caused by loosness and backlash in the focuser? you could install a Starlight instruments micro focuser, an easy 15 minute project. No, it won't work. The lockdown screws are positioned opposite to the focusing knob on a C14. Frankly, I don't even understand how this works on a Meade unless the problem is due to slop in the focuser knob. Adding springs will do nothing to better constrain the tilt of the primary. 1..If I remember correctly, the screws were m8 or m10 nylon. 2..I removed the mirror from the slider tube when I did my mods. 3..I put the rear screws just in front of the first surface of the mirror and the forward screws about 10mm behind the front edge of the slider tube. This allows you to adjust the slider tension screws from the front with the corrector plate out of the way. This way you will not have to pull the mirror assembly back out to make adjustments, should you need to. The shift is due to a small amount of tilt in the primary due to the fact that there is A) Too much mechanical slop in the baffle tube mount, and B) The focuser drives the mirror from the side. The other problem for those of us doing photography is that gravity can cause the mirror to shift in tilt as the telescope tracks during an exposure. When you are trying to achieve arc-second level image stability, virtually any mirror motion really screws things up. I found during my time assembling Dynamax scopes that if the baffle and slide were a really good fit, there would be very little image shift and hardly any lubrication would be required. If there was some play, there would always be some image shift. Thick lubricants helped, but only to a degree. The threaded holes in the slide sounds like an effective fix, but that is not a level of disassembly that all owners would be comfortable with. Sometimes a 90 degree rotation of the slide (still a major job) can change the amount of image shift present. Not always, but if I was breaking down the scope, I'd try that before drilling the slide. "Is there a way to fix SCT Mirror shift?" Indeed. Purchase either a fixed mirror or all-lensed telescope.